Berrimilla’s crew eat out of stainless steel dogbowls because they are stable and easy to hold and to keep clean. A couple of the dogbowls were made into trophies for the Fastnet race (UK) and the Middle Harbour Yacht Club’s Old Farts Race (Australia). Boats, especially little ones like Berrimilla, tend to crash around a lot and move in 3 dimensions. Everything has to be tied down or otherwise restrained. Every horizontal flat surface has a “fiddle” around its edge – a little wooden wall to stop things sliding off and there are special fittings for holding mugs and glasses. (Always plastic ‘glasses’ and bottles and containers – gin, olive oil etc decanted from glass into labelled plastic – broken glass in a boat is a dreadful health hazard and completely avoidable). In particularly violent pitching and rolling, ordinary plates, cups, spoons, books, spectacles laptops etc simply launch over their fiddles and fly across the boat to crash into something on the other side like my head. A normal plate or bowl is exactly the right shape to assist such a launch and they are diverted upward by fiddles. The Berrimilla Dog Bowl Trophy for the best double handed boat from Class 4 in the Fastnet Race. 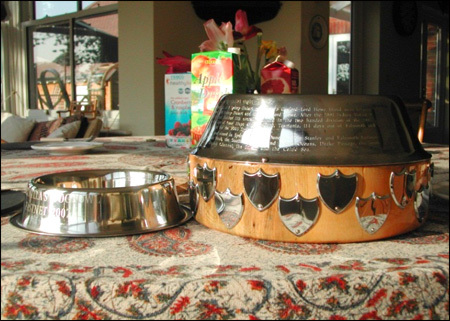 There is now a Berrimilla Dogbowl Trophy for the best double hander from Class 4 in the Fastnet Race (Class 4 is the slowest group of the race according to the handicapping system ‘IRC’). 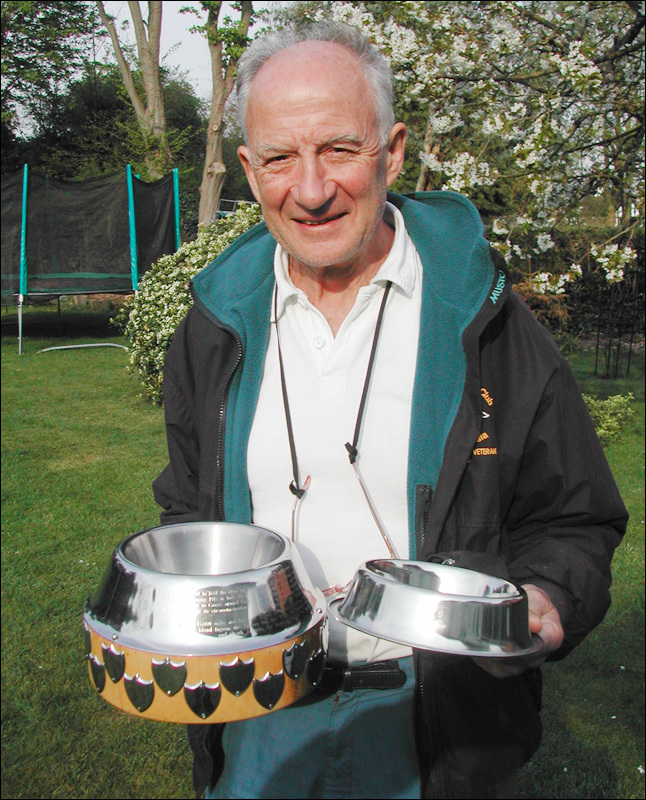 The trophy is one of the original stainless steel dog bowls that was used on Berrimilla’s first circumnavigation. The smaller one in the photo is a keepsake for the winner. 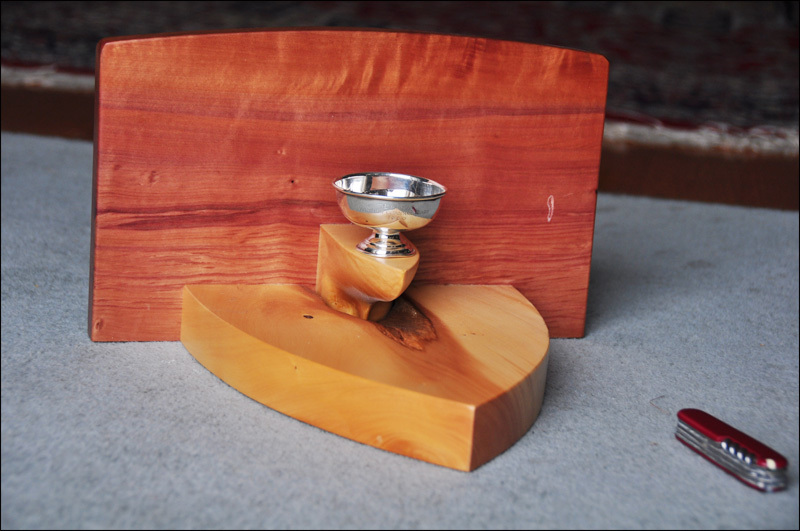 The base is Huon Pine from South-Western Tasmania and is between 1000 and 2000 years old. Huon Pine is resistant to rot and to most forms of marine organism. It is considered to be one of the best timbers in the world for building wooden boats. 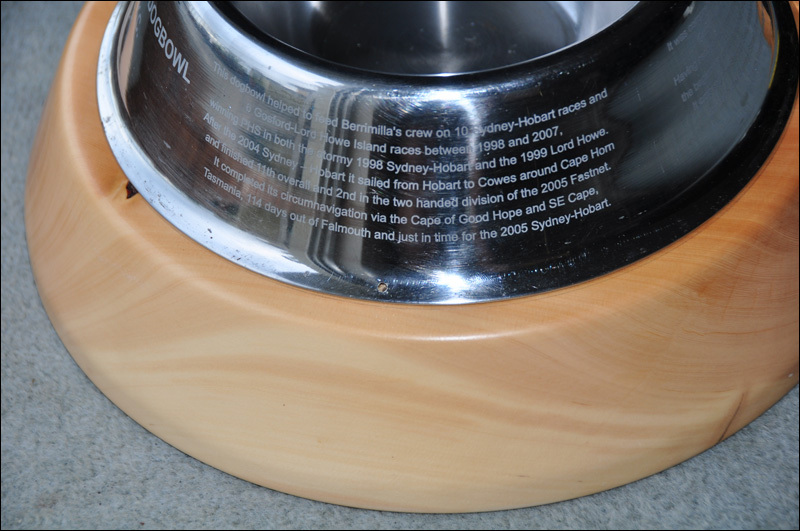 This dogbowl helped to feed the crew on Berrimilla in 10 Sydney-Hobart races and 6 Gosford-Lord Howe Island races between 1998 and 2008, winning PHS in both the stormy 1998 Sydney-Hobart and the 1999 Lord Howe. After the 2004 Sydney – Hobart it sailed from Hobart to Cowes around Cape Horn and finished 11th overall and 2nd in the two handed division of the 2005 Fastnet. It completed its circumnavigation via the Cape of Good Hope and SE Cape, Tasmania, 114 days out of Falmouth and just in time for the 2005 Sydney-Hobart. It has sailed about 50,000 miles and has been dipped and rinsed in Sydney, Hobart, Dunedin, Port Stanley and Falmouth harbours and in Lord Howe Island lagoon, the Tasman Sea, Bass Strait, the Southern Pacific and Indian Oceans, Drake Passage, the South and North Atlantic, the English Channel, the Solent and the Celtic Sea. 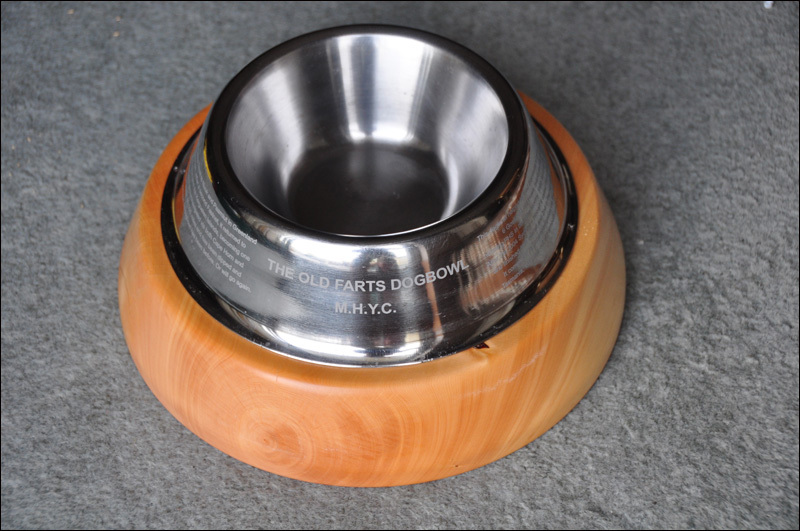 This dogbowl helped to feed the crew on Berrimilla in 10 Sydney-Hobart races and 6 Gosford-Lord Howe Island races between 1998 and 2007, winning PHS in both the stormy 1998 Sydney-Hobart and the 1999 Lord Howe. After the 2004 Sydney – Hobart it sailed from Hobart to Cowes around Cape Horn and finished 11th overall and 2nd in the two handed division of the 2005 Fastnet. It completed its circumnavigation via the Cape of Good Hope and SE Cape, Tasmania, 114 days out of Falmouth and just in time for the 2005 Sydney-Hobart. It was comprehensively dunked when Berrimilla was rolled and dismasted off Gabo Island during her return from the 2006 Sydney – Hobart. Having recovered from this indignity, it left Sydney for the Aleutians in April 2008 at the beginning of its second circumnavigation, this time via the North West Passage. It crossed the Bering Sea, stopping at Adak, Dutch Harbour and Nome and sailed through the Bering Strait. It went on to complete only the 114th transit of the North West Passage since Amundsen in 1906. Thence across the Baffin Sea and Davis Strait to Nuuk and Paamiut in Greenland and on across the Atlantic to Falmouth. 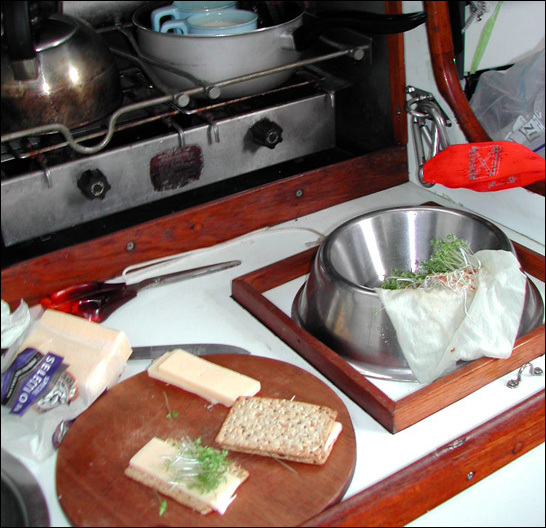 After a second Fastnet, it returned to Australia around the Cape of Good Hope and the Kerguelen Islands, becoming one of only three dogbowls in history to have circumnavigated via both Cape Horn and the North West Passage. It has sailed about 80,000 miles and has been dipped and rinsed in some interesting places where perhaps no dogbowl has been before. Or will go again. This little cup was the winner’s keepsake from the 1930 Channel Race. It was won by Spica, a yacht that was sailed by the owner, J.T.Hunt, and his family. The cup was inherited by Caroline Glover from an aunt, a friend of the Hunt family and she presented it to Peter and Alex after their Sydney-Hobart, Fastnet, Sydney-Hobart circumnavigation in 2005. Peter and Alex felt that the cup should perhaps go back to Royal Ocean Racing Club (RORC) as a perpetual trophy rather than sit on a shelf somewhere in Australia, so after Consultation with Caroline, a mount was made for it in Hobart from Huon Pine and Tasmanian Myrtle and the trophy was presented to RORC in 2010. In keeping with the tradition set by Spica’s owners, the trophy is to be presented to the best performed boat sailed principally by the owner’s family in a RORC Channel Race.